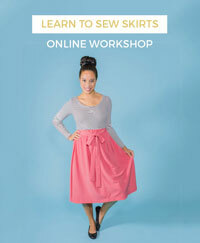 If you've signed up to the Learn to Sew Jersey Tops online workshop, you will already have seen this one. 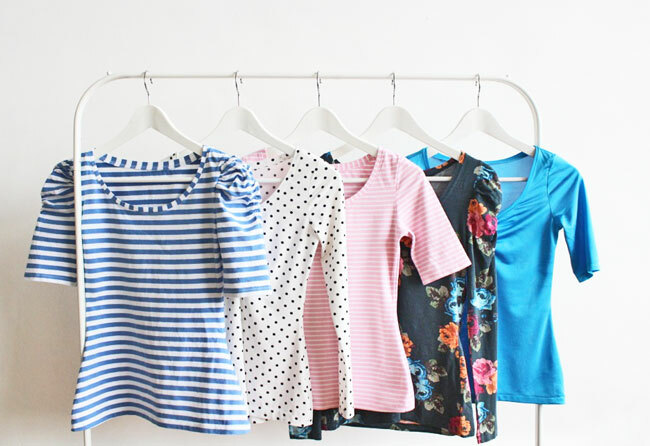 No frills - just the plain sleeve and plain neckline version for every day. 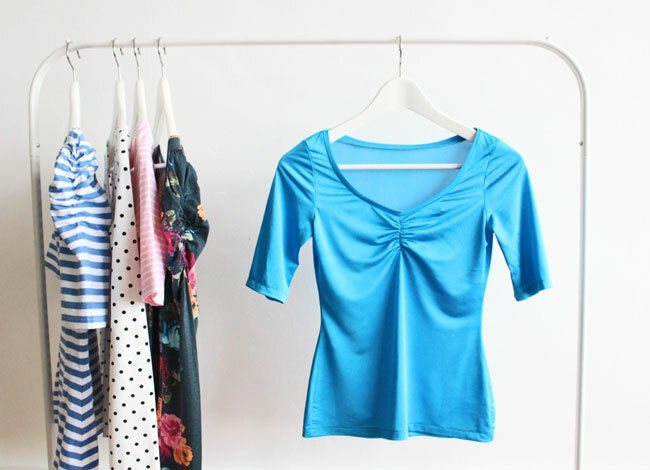 The fabric was given to me by one of this blog's lovely sponsors, Dragonfly Fabrics - it's an absolutely gorgeous quality cotton jersey, baby soft with a nice amount of stretch and recovery. They have it in a whole load of different colours - I see plenty more of these in my future. It's one of those garments I miss severely when it's in the laundry basket. This one is a shiny shiny leotard fabric picked up from somewhere on Goldhawk Road. Our pattern cutter made a sample in this fabric during the development process and I loved it, so thought I'd make one for myself. 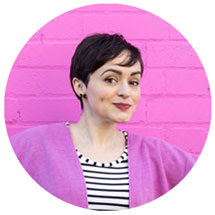 However, the shiny, shadow-casting fabric shows up every seam line of my bra and every single wrinkle of fabric is exaggerated. Plus it's very booby! I'll spare you a pic of me wearing it :) I reckon a black leotard fabric wouldn't be so unforgiving though - it'd look pretty cool, non? I lurrrve this one (sigh). The fabric is from somewhere on Goldhawk Road again, it's a slinky viscose-lycra kinda thing. 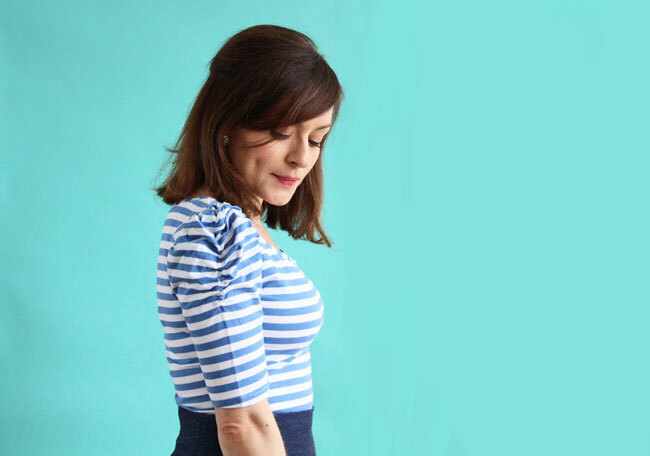 I wear it a lot tucked into jeans or skirts (pictured here with one of my Miette skirts) - basically it goes with everything. 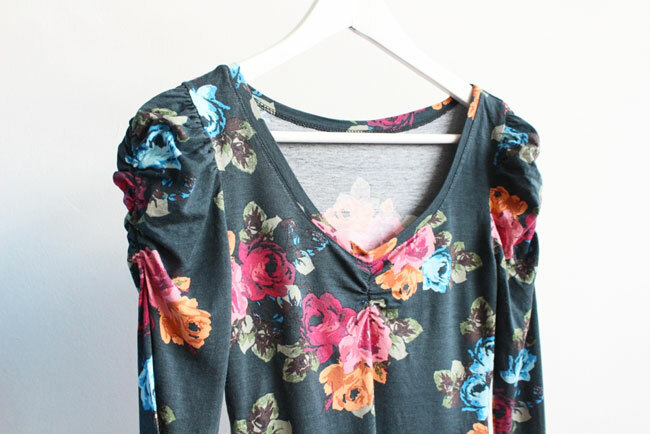 For this one, I added both the ruched neckline and ruched sleeve. 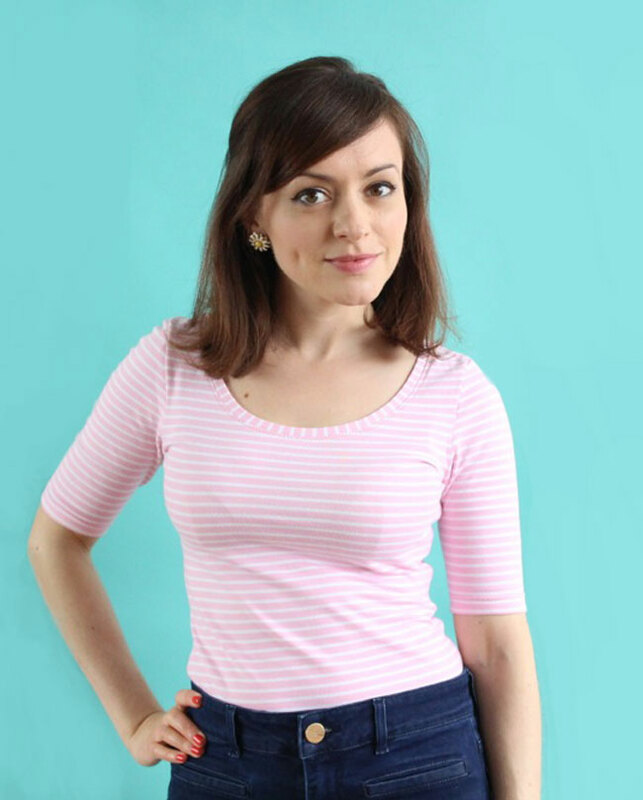 The rose-print jersey is from Walthamstow yeeears ago. You may not be able to tell from the photo, but the background is a lovely dark petrol blue. The jersey is quite a bit drapier than the blue and white stripe fabric (below), so the puff in the sleeves is less pronounced. Still cute though. 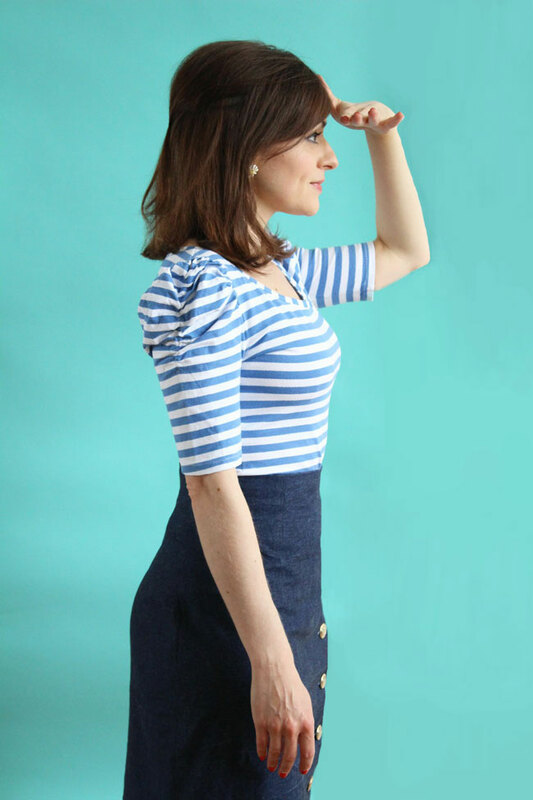 Last but not least, this is the version that you may have seen in the pattern instructions and model shots - it seems to be popular on Instagram :) It was sewn to the model's measurements so is a little big for me around the shoulders and upper chest, but I've been wearing it happily anyway. I bought the fabric from a company called Montreux Fabrics at the Knitting and Stitching Show this Spring. I tried emailing them to see if they still had it, but didn't hear back unfortunately. 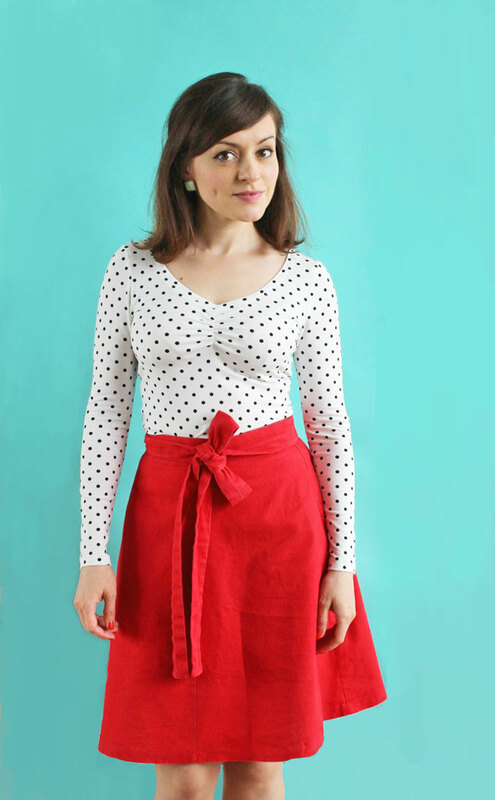 Again, it goes well with jeans, shorts, and all kinds of skirts (I'm wearing a denim Arielle skirt here with anchor buttons). 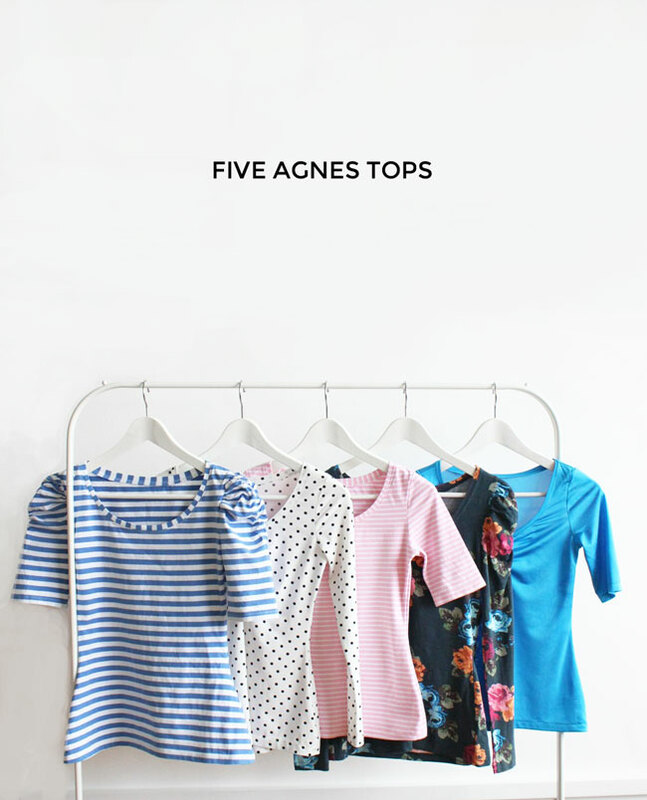 So those are some of my Agnes tops. I'm really looking forward to seeing yours! 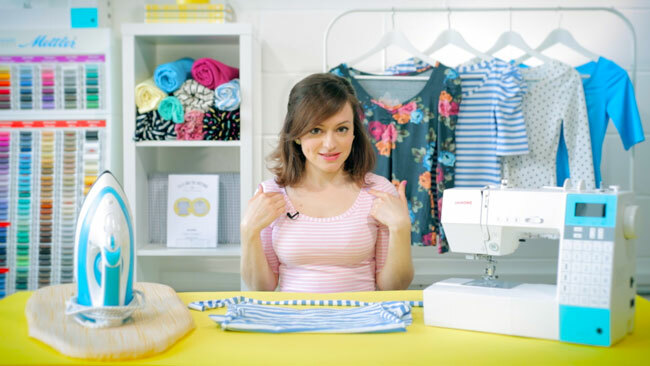 Take a look at the previous post on fabric suggestions for Agnes if you haven't seen it already. What fabric are you going to use?